Balanced, inviting to touch... a lovely way to display books and treasures. I love everything about this! 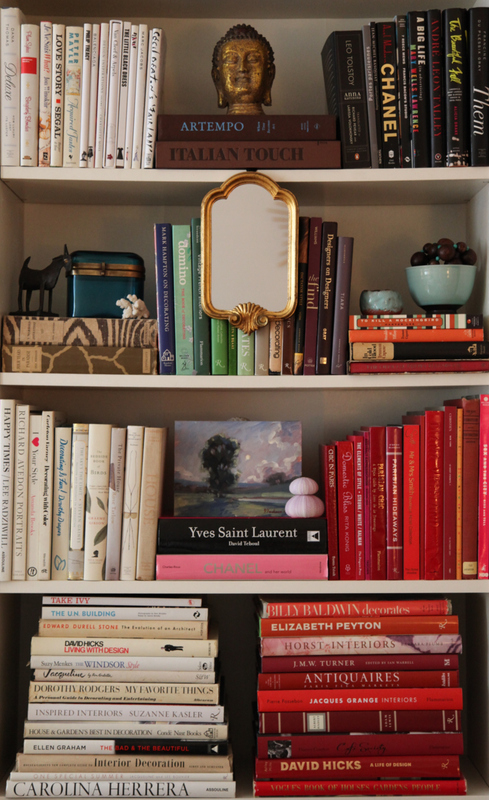 The books grouped by color, the little oil painting sitting on the YSL book on top of the perfect shade of a pink book. The two little sea urchins, the mirror....makes me want to go rearrange my book shelves! This is great. I just did this to my own shelves in my office and now I'll have to compare becase I LOVE this picture! I always love beautifully styled bookcases but this one is even better because it actually has a lot of books! Ahhh, so beautiful! That petite mirror tops it off perfectly!